Once again the weather is gloomy. This time, however, I don’t mind it too much. I actually enjoy days like these when I can sit by my bedroom window, blog, enjoy a cup of Vietnamese coffee, and listen to baby’s lullabies (Harrys Cupboard– this piano music is sooo relaxing, you must listen to it!) while Zoey takes her afternoon nap. This is probably one of those moments during the day when I feel most inspired. At this second, I am completely inspired by cowhide rugs. More specifically, the natural toned/ white ones. Below’s a roundup from my Pinterest board, Abode. Click on image for source. Diggin’ the combo of the white cowhide rug w/ a lucite coffee table. It’s amazing all the choices that these Cowhide rugs come in. Below is a natural tone one with gold foil! 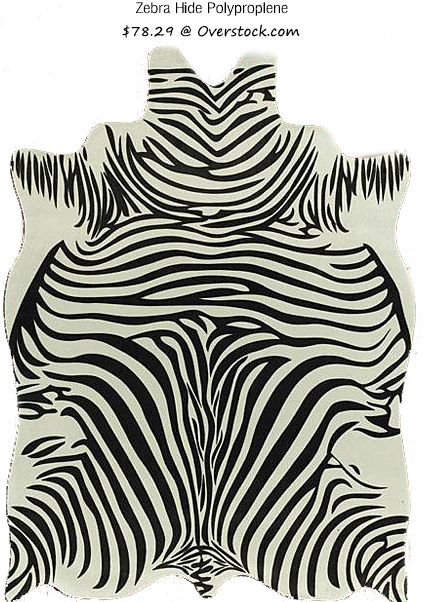 How FAB does this Zebra rug look in the dressing room?! And if you are not into the real deal or just want an inexpensive alternative, here’s a Polyproplene one from Overstock for just under 80 bucks! If you already like Ikea, you are going to LOVE them for carrying Koldby cowhides for an affordable $199 (well…compare to all the other prices!). 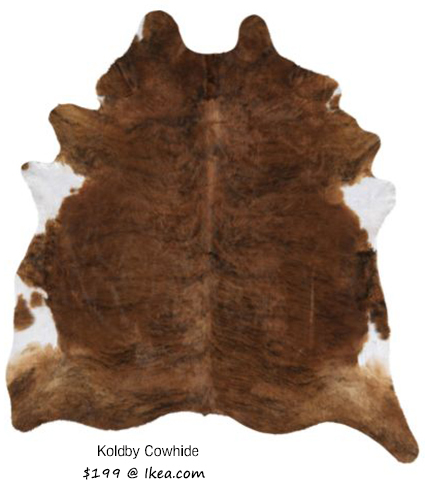 Koldby Cowhides also comes in White and Black. Don’t you love a deal? So what’s your verdict on the cowhide rugs? Would you want one for your living space? Please share! Btw, like what you see? Follow me on Pinterest for more inspirations. Cowhides are indeed beautiful in our homes. These rugs that you have here are the most popular ones, but for me seeing cowhides almost everyday, I want to be bolder. Hahaha. I really want the hot pink cowhide rug in my living room! Check this out. Love the dressing room space! I’m liking the cowhide hung right down to the floor alongside the cowhide. I think the white was is gorgeous…now I just need a place to put it! I have always been scared of the “all white” look but I am in LOVE now! I know exactly what you mean!! It’s scary and intimidating especially when you have kids but I’m sure that there are people out there who’ve conquered the impossible! And if you don’t have little ones, you just go for it! It is weird because I’m looking at all the furniture legs and oooing and ahhhing all over them. I love that these are so aaffordable!! My girlfriend likes them, can´t say I have the money for them, at least the real ones. I´m getting in a jam here. Wow, GORGEOUS and inspiring post! Wow! I love the white one. It just feels so home. The one from Ikea would be a wise buy for me too. Aaah yes, white with a baby….